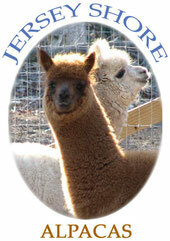 Jersey Shore Alpacas - Jersey Shore Alpacas - Fleece and Fun for Everyone! Jersey Shore Alpacas is a small farm owned and operated by Jim and Tish Carpinelli, and located in Green Creek, a small town near historic Cape May, NJ. 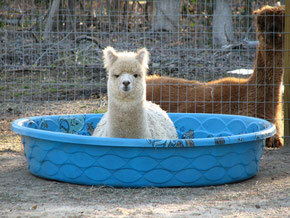 We take pride in ensuring that our alpacas are cared for with the utmost attention to their health and happiness. Our farm focus is agritourism (farm tourism), and our alpacas are happy to oblige by enthusiastically greeting visitors! Check out this cool video of our farm from Channel 6 Action News in Philadelphia (just after the paddleboarding segment). Note: our schedule is not correct in the video. Please see below for our hours. Enjoy this quick look at our farm! We are open to the public every Saturday 10am-4pm, without a reservation. We do accept private appointments Mon.-Fri. only. Please call or email us for a reservation. Reservations must be confirmed in advance. A bit more information . . . The main difference between an "open farm day" visit and a private tour is that on "open" days, you can feed carrots to the 'pacas at the fencline, and there is a tour guide outside to answer questions. The private visits include actually going into the paddock with the female alpacas for feeding and mingling (sort of like "swimming with the dolphins," but without getting wet!). Also, your tour guide is for your group alone, so you can ask as many questions as you like! Note: Private tours are one group at a time, and not combined with any other visitors. Please visit our FAQ page for more information about visiting our farm! For our French-speaking visitors, check out our informational video in French here.